Bike Pic March 1, Here in the Twin Cities Winter is Teasing Us With a Taste of Revenge! The weather has fooled us once again here in Minnesota! Looks like Mother Nature has come back to tease us with another taste of revenge this winter. But have no fear, this snow should only last a day or two and then we’re back into what feels like an early spring to plan your #NextBikeAdventure. So, if you are bummed about the snow or traffic hassles it has caused, while you are waiting register for the Minnesota Ironman Bike Ride! Early registration ends the end of this month! Also, please view the Winter Edition of the Minnesota Bike/Hike Guide and remember to register for the Root River Bluff & Valley Bicycle Tour and all the other fun rides coming up. 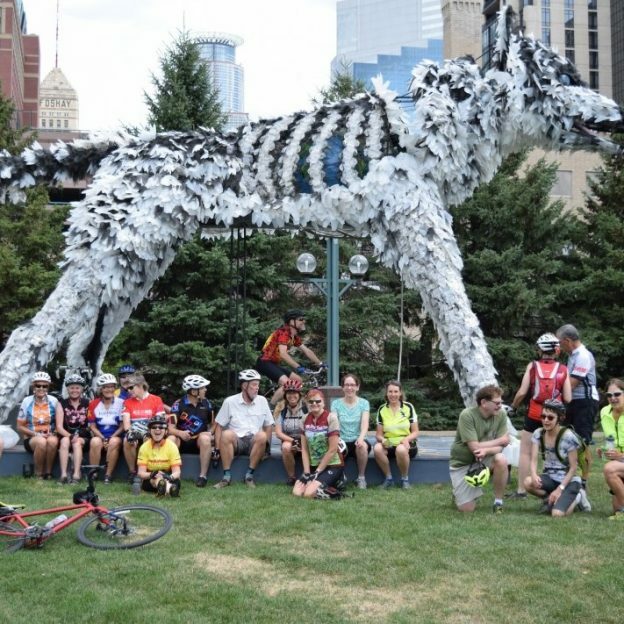 Photo taken of riders from the Hiawatha Bicycling Club exploring parts of the Twin Cities, along the Mississippi River Trail, and finding this unique art forms along one of their ride. This entry was posted in News, Picture of the Day and tagged #bicycle, #Mississippiriver, #mnbikeguide, #nextadventure, #nextbikeadventure, #onlyinMN, #picofday, #picoftheday, Bike Guide Minnesota, Bike Guide MN, Hiawatha Bicycling club, Minnesota Bike Guide, Mississippi River Trail, MN Bike Guide on March 1, 2017 by Stephanie Hunt.